Just a few years ago, we were wondering where all the movies about outer space had gone. And now, we don’t have to wonder any more, because we’ve been getting a crop of fantastic new movies about astronauts, spaceships, and the joy of exploration. There have been at least a couple of previous golden ages of space movies—the period following 2001 comes to mind, and so does the boom in space-opera adventures after Star Wars. The post-2001 boom saw a handful of idea-rich, very human-focused movies about ideas, which used space and science fiction as a way to further conversations and arguments that were rooted in the eras they were made in. Space, following Star Wars, became a fantastical, otherworldly setting, full of the magic and monsters of pulp serials and fantasy, dressed in other-worldly garb. Those two different movements didn’t ever go away entirely—idea-heavy, thought-provoking movies inspired by 2001 still exist today (including Moon). And obviously, the influence on Star Wars in film and science-fiction beyond is something that still resonates 40 years later. But in the last couple of years, some of the biggest science-fiction blockbusters haven’t been about far-off galaxies or chiselled heroes doing battle against alien beings. They’ve been about space. The settings? Shuttles and space stations, or planets within our reach. The heroes? Astronauts. The monsters? The harshness of a life beyond our Earth. Something met, not with a mystical force or a laser pistol, but with science and human ingenuity. Gravity, Interstellar, and one of the best movies of 2015 so far, The Martian, all rooted themselves in a dedication to portraying realistic science-fiction about the joys and dangers of space exploration. They largely succeeded on that front (although you can pick holes in their science, such as Interstellar ultimately sacrificing its black hole’s appearance for spectacle rather than scientific accuracy, or The Martian mixing great science portrayals with less-great ones), regardless of what good or bad you think of them as films. We’ve also had a few smaller, but still brilliant, space movies recently, like The Europa Report. The central characters of these films are problem-solving engineers and scientists. Their storylines celebrate both space itself and the triumph of the human spirit to explore and survive in it, no matter how harsh it is as an environment. None of these are small scale films—they’re blockbusters, huge tentpole films that made millions of dollars and won awards. That these films exist on such a scale, telling a story that leans into the realm of “fiction about science” definition of “science fiction,” is remarkable. They’re among the first in what is hopefully a brave new era of realistic space movies. These films are also technical marvels, which benefit from huge advances in movie-making technology. Just look at how Alfonso Cuarón combined CG and motion-capture with practical effects—and carefully choreographed routines that were basically like a huge ballet dance—to create something that tells a story in a visual way that few movies had before. Or the incredible lengths that Ridley Scott went to, to bring Mars to life. Or how amazing VFX technology was used to transform Jordan into Mars for The Martian, or Interstellar’s high-tech models to depict its spaceships. These movies don’t just inspire modern audiences, they’re basically only possible because of the technology prevalent in movie-making today. And they couldn’t come at a better time. We need something to get us excited about space again, because even though space exploration is reaching an exciting new phase—the exploration of Mars through Curiosity, the Philae lander’s mission to Rosetta—it’s also under threat like never before. NASA is dealing with government meddling and budgetary constraints. Gravity was released just days after the first U.S. government shutdown since the mid 90s locked out 97% of NASA’s workforce from doing their jobs. The release of Interstellar prompted scientific journals based on the film’s research, and calls from the science community to use it as a learning tool. NASA both helped with research and supported The Martian’s publicity drive in a huge way, piggybacking on the interest in the film with the announcements of its own plans to send humans to Mars within the next twenty years—but at the same time, NASA is woefully underbudgeted for this mission by the U.S. Government. At a time when interest in space is growing and growing, and a time where our capacity to capitalize on that interest is being held back, movies that inspire and educate people about Space Exploration aren’t just fun to watch, they’re vital. For the advancement and embracement of bodies like NASA, there has to be a public enchanted and interested in life beyond our own planet. You can fire them up with amazing scientific discoveries, but it’s even easier to get through to them with entertainment. 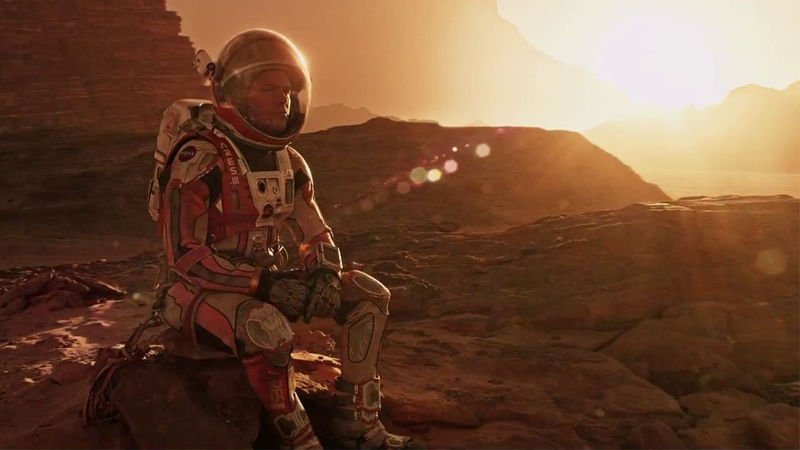 If movies like The Martian make us want to be Astronauts like Mark Watney, then more power to them. We need more Mark Watneys if we actually want to reach Mars by the 2030s. We need that interest, and a swathe of movies promoting and embracing that interest is wonderful to see. They put Astronauts on the same level of superheroes, supersoldiers and Jedi Knights—astronauts are the new action heroes. And it doesn’t hurt that we’re getting these more realistic space movies at a time when blockbuster space opera is also having a bit of a resurgence—with things like Marvel’s Guardians of the Galaxy alongside the return of Star Trek and Star Wars. It’s just amazing that alongside them we have these films, still as epic, still as in love with the concept of science-fiction and space, but with a jolt of realism in the here and now. We’re slowly but surely stepping into a brave new era of humanity’s own exploration into Space and other worlds. It makes perfect, wonderful sense that, at the moment, our science-fiction movies are reflecting that.